In the mid 1770’s, when war between England and the American colonies became imminent, the British tried desperately to convince the Iroquois Confederation to join them in their fight against the Americans. The Americans, realizing the immense importance of having Indian allies, also tried to entice the Iroquois to aid their cause. The strength of the Iroquois Confederation, for hundreds of years, was the unity of it’s’ members. The confederacy was first formed in the mid 1400’s by the nations of the Mohawks, Oneidas, Onondagas, Cayugas and Senecas. The Tuscaroras were admitted to the confederation in 1722 and became the sixth member nation. At a great council at Onondaga, the capital of the Six Nations, the members discussed at length, the options available to them. For war to be declared, the decision had to be unanimous. The Mohawks were in favor of supporting the British, the Onondagas were for neutrality, the Cayugas and Senecas were not especially sympathetic to either side and the Oneidas and Tuscaroras were in favor of aiding the Americans. The Oneidas and Tuscaroras were basically friendly to the Americans because they had not been forced out of their traditional lands as had been done to the Mohawks. Finally, after it became apparent that a consensus of opinion couldn’t be reached, a Mohawk War Chief named Thayendinagea stated, “Let each nation be responsible for its own members. Let each nation decide for itself what path it will take in this war”. This proposal was adopted and became a major factor in the eventual loss of power of the Iroquois Confederation. 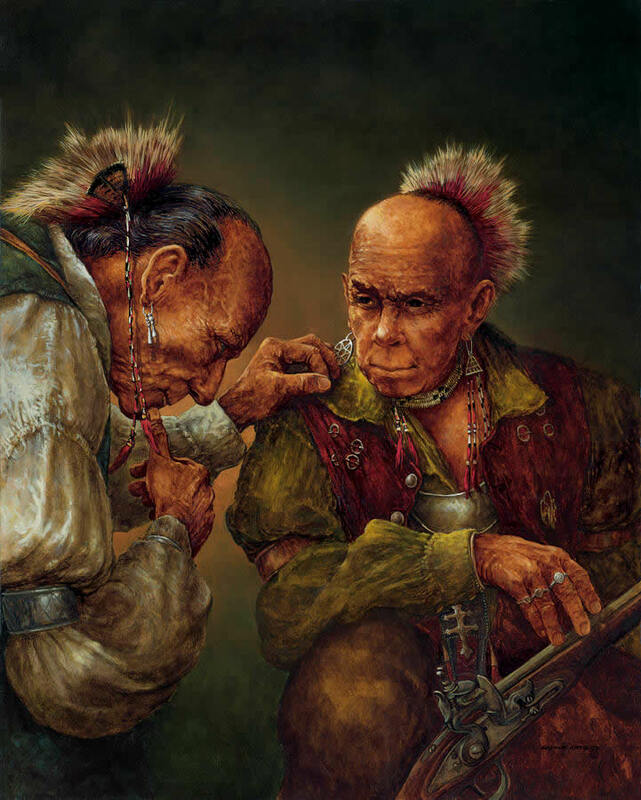 The painting entitled “Crucial Decision” depicts two Tuscarora brothers trying to reach a decision which would be best for them, their families, their nation and the present and future generations.